Ever need to make a dish and find you are out of a seasoning blend called for? No packets of chili seasoning in the cupboard? Don't want to keep Pumpkin Pie spice on hand for the couple of times you use it? Just mix up your own. These recipes are in parts, so you can scale up or down to make as much as you want. Awesome! I was just thinking about needing to make up some taco seasoning to refill my jar! Now I have a recipe! Thanks also for the comment on my blog. 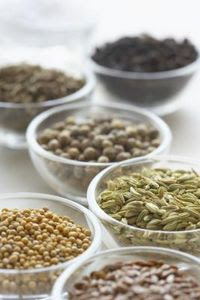 Funny- I just done a post on homemade seasonings earlier today. You have some good ones that I didn't have. I really enjoy your blog even though I don't comment very often. CompleteLee Blogger: Glad to help :) and you are very welcome! Oh I LOVE this Barbara, I've bookmarked. Glad you like it Sandra. The chili recipe gave me the idea, since I was listing out my blend and putting or two packets. Thought others might find it helpful. I listed it in parts because I usually make more of it up than what you need for a single recipe. I have a large collection of seasoning recipes but you shared a couple I didn't have. I do love making my own seasonings - thanks so much for sharing these! I've always made my own homemade "mixed" seasonings too, Why spend all that money and so many are full of fillers like the taco seasoning. Hi, Thanks I never even thought of mixing my own, Great Ideal. Wow! Thanks Barbara, that's a handy list for those of us who are 'cooking challenged"! I'll print it and keep it handy. This is awesome, thank you for posting it. Can I be the only person in the world that used pumpkin pie spice all year long? I HEART pumpkin (but not too fond of the pie, go figure). I add the spice to my coffee a lot of the time, sprinkle in french toast egg, sprinkle it on buttered toast, just about anything! However, since I use it so much I tend to run out ... now I know how to make more and more and more!